Manual shifters have a weakness in the factory isolator between the shifter & the stick that wears out over time and can cause shifting gears to feel soft or inaccurate. The Shifter Stick replacement from B&M racing takes care of this issue with heavy duty O-rings that not only reduce gear noise, but results in shorter and more accurate shifts. This shifter stick is manufactured from strong 4340 nickel-chromoly steel, and incorporates improved bends which gives more leverage in shifting while providing more comfort over the factory shifter stick. 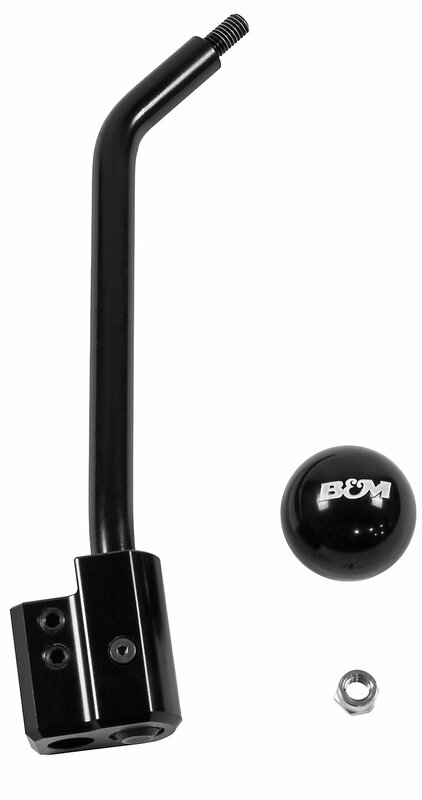 Included is the round e-coated black shift knob that features the B&M logo. The shift stick features a 3/8 x 16 thread pattern which will be compatible with most brands and styles of aftermarket shift knobs, so you can customize the look to your own style. Upgraded Strength: The Shifter Stick features upgraded O-rings that replace the stock isolators that are prone to wearing out, causing a mushy or soft feel while shifting. This is specifically designed for the 05-18 Wrangler TJ and Wrangler JK Jeeps with the 6 speed manual transmission. Precision Shifting: With the improved bends in the shaft, along with high strength nickel-chromoly steel materials and the replaceable four O-rings, transmission noise is significantly reduced along with shorter and more precise shifts. Customizable: The Shift Stick includes an e-coated black shift ball with the B&M logo in white across the face, but the shift stick features a 3/8 x 16 thread pattern that will accept most brands of popular shifter knobs if you want to create your own look. I thought spending almost $200 on a shift handle for my manual transmission was a bad decision on my part. After installing it, I would have never thought that changing out this part would make that much of a difference. I also have the B&M shifter and both of these together has finally made the shifting experience feel like it is suppose to. I do not regret this purchase at all and I should have done it sooner, excellent work B&M!!!! Installed this product ~6 months ago in my RHD JK (2012), and it has been awesome, I consider it a must-have upgrade for all manual JKs. The shifter feel is much more direct and precise, especially when going into reverse, owing to the removal of the huge factory rubber dampener/isolator. Cabin gearbox noise is a tiny but higher but essentially no different to stock. This shifter stick also allows a an aftermarket shift knob to be screwed on directly, which is a massive improvement over the stock plastic shift knob. Note that an adapter shim/thread is required for Sickspeed knobs owing to the different thread diameter and spacing, but I believe the knobs available from Quadratec will screw right on. I was also considering ordering the upgraded B&M racing shifter in addition to just the shifter stick, but just the shifter arm improved the feel so much with just the stock shifter that I haven't felt the need. If you're considering buying both, maybe order this first and then decide if you want to do the full upgrade after. The only downsides to this product, and the reason for 4 stars instead of 5, are due to the provided shift knob and install instructions. The shift knob that this arm comes with is a bit small, and is coated in a rubbery plastic that I struggled to find comfortable. Luckily I already had a cueball shift knob ready to go, so this wasn't really an issue for me, but if you're just buying this by itself, I recommend picking up a cueball shift knob to go with it. To remove the factory shift knob, don't bother removing the plastic shim like they do in the install video - it doesn't do anything. Instead, twist the knob back and forth (clockwise then counterclockwise) firmly but very quickly, while pulling. It should pop right off - no huge amounts of force required. To remove the factory shift stick, undo the main bolt and then torque/twist the entire stick. Spray some WD40 or lubricant around the edges of the hole, so that it gets in between the shifter stick dampener and the shifter link arm itself (avoid spraying into the thread). Keep twisting the shifter stick left and right until the lubricant works its way around and eventually frees the shifter stick. When installing the new shifter stick, it doesn't have to just sit at a right angle to the flat edge on the shifter link arm (and probably shouldn't). The grub screws have plastic tips such that they can be fastened to the shifter link arm at a range of angles. Install the shifter arm at the desired angle with just the main bolt, test it to make sure it's comfortable and won't strike the t-case knob, and then tighten up the grub screws when you're 100% happy with the position. Hope this helps - this things really is a must have.